The FIFA World Cup is fast approaching and for those who are not lucky enough to be watching the games live in stadium, the next best thing is to catch the game on T.V. with some friends whilst sipping a tasty beverage. The World Cup is adored and watched by billions around the planet and will likely be watched by those living in a variety of different timezones. With 64 games making up the event, trying to remember what is on when, and which channel the game is on, poses it's challenges. If your time difference calculations are not Stephen Hawking'esque in their accuracy then you may not be watching the World Cup at all. CalReply has addressed the issues and presented a solution for all football fans out there. Using CalReply, fans across the world can add the schedule of all the games or just those of a specific team to their calendar and with a friendly reminder just before the game, can be assured that missing a game will only be a matter of choice rather than memory. Spain, Brazil, Australia and the United Kingdom are all using CalReply and more are on their way. It all starts with a Tweet or the click of a link. In Australia the FIFA World Cup is being broadcasted by SBS and CalReply is working with them to drive tune-in across Australia. SBS has used television commercials and social media as their preferred medium to communicate CalReply to their audience. 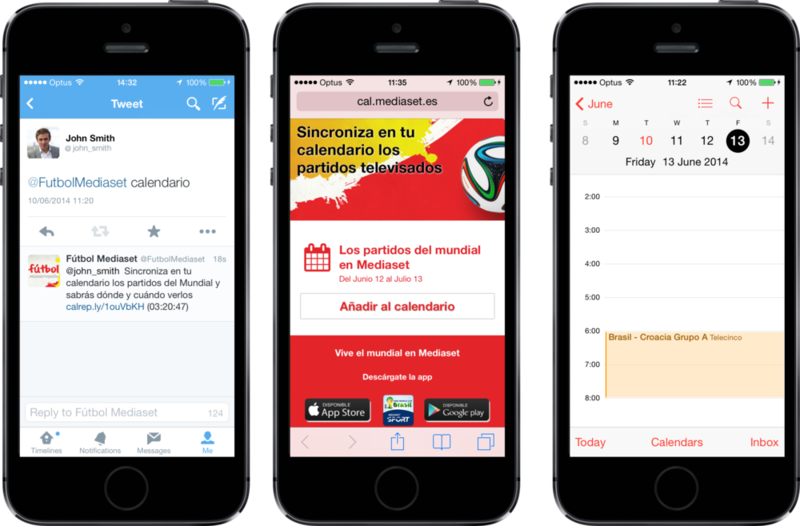 In Spain the FIFA World Cup is broadcasted by Mediaset and CalReply is working with them to drive tune-in across Spain. Mediaset has used social media as their preferred medium to communicate CalReply to their audience. In the UK, FIFA World Cup games are being broadcasted by ITV and CalReply is working with them to drive tune-in across the country. ITV have has used television commercials and social media as their preferred medium to communicate CalReply to their audience. In Brazil, the home of the FIFA World Cup, games are being broadcasted by SporTV and CalReply is working with them to drive tune-in across Brazil. SporTV has used television commercials and social media as their preferred medium to communicate CalReply to their audience. Não perca nenhum jogo da Copa do Mundo FIFA 2014. Tweete para o @SporTV a palavra Copa e receba o link para instalar o calendário.